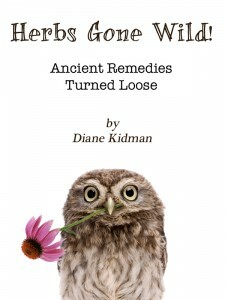 Herbs Gone Wild Goes Free for One Day! I’m doing a bit of an experiment today and have decided to make my ebook Herbs Gone Wild free, one day only, 01/06/12, through midnight PST. Almost halfway through the day so far, and already over 1,300 people have snagged themselves a copy of herbal deliciousness! You, too, can enjoy this healthy ebook treat. Doesn’t your Kindle deserve it? Yes, it does. It follows you everywhere, even has to sit in that big ugly bag all day waiting for your lunch break. I know because it told me so. It wants herbs. Greenery. Natural remedies, not the artificial stuff. I think what your Kindle really wants is to learn how to make homemade salve. And herbal tea. And cherry cough syrup. Main points you should know about writing a dissertation. There, now, doesn’t it make you feel good to give to your Kindle? And it didn’t cost you a thing. 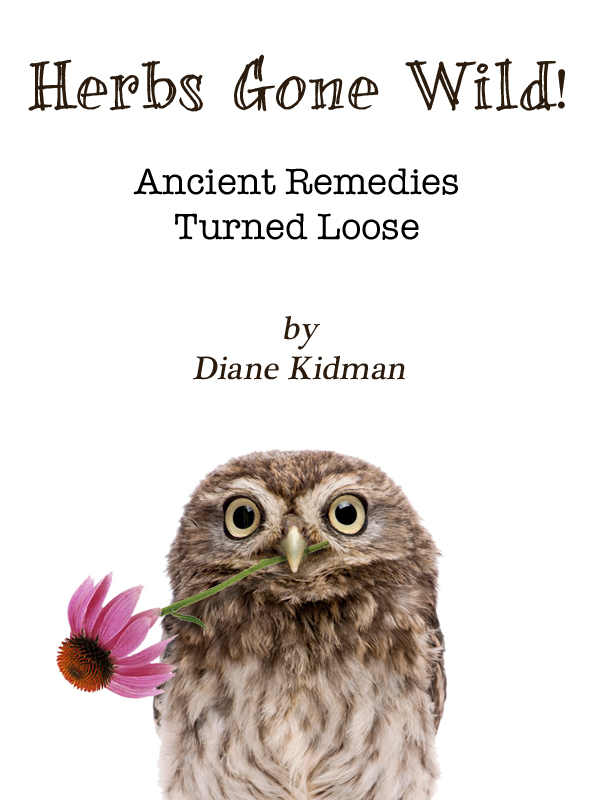 That’s right, “Herbs Gone Wild: Ancient Remedies Turned Loose” has been written by yours truly, Diane Kidman. Much thanks to those of you who have given me input over the years, inspiring me to go a step further in custom essay writing. “Herbs Gone Wild!” offers a wide variety of simple remedies, giving everyone the chance to be their family’s home herbalist. You’ll learn how to naturally deal with cold and flu viruses, how to lower blood pressure, fix a migraine, even make your own salves and tinctures. And occasionally I’m funny. If you need to buy custom essay, visit Weeklyessay. You can find my eBook on Amazon and Barnes & Noble, with more places to come. The current price is only 99 cents, which is the best way I can think of to say thank you to all your support over the past five years of blogging. It’s also the best way I can think of to introduce the world of herbalism to you, providing a less expensive (even free) natural alternative for your family’s health. The short short. I’ve come to love that form. It takes a talented writer to cram a novel’s journey into a mere page or two. Slovenian writer Andrej Blatnik seems to have the knack for this concentrated form of art. You Do Understand is 112 pages of short shorts that, if you’ve not tried them before, are sure to make you a fan. As a grouping, Blatnik’s stories have a strong undercurrent of relationships – what makes them tick, what breaks them, what makes them make us lonely within them. One thing’s for sure, you’ll enjoy pausing between each to reflect, laugh, cringe, remember when you did something horribly similar. Translated by Tamara M. Soban, the stories flow so well in English you’ll forget that’s not their first language. You Do Understand is part of the new Slovenian Literature series from Dalkey Archive Press, a publishing house dedicated to bringing some amazing works to American readers. Blatnik’s collection of short shorts is a prime example of why such an endeavor is worthwhile. 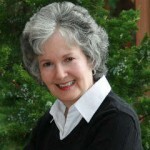 Baker’s style although compared to greats like John Irving and the Brothers Grimm, is no doubt all her own. Although one can certainly draw parallels with other novel-writing greats such as Irving, Baker’s voice feels unique and one of a kind to me. She has the ability to really let loose while still maintaining control of her pen, as in The Little Giant she subtly adds occasional tastes of fairy tales we all know – just to remind you that indeed this is a story of magic like those we loved as children – yet darker and deeper. 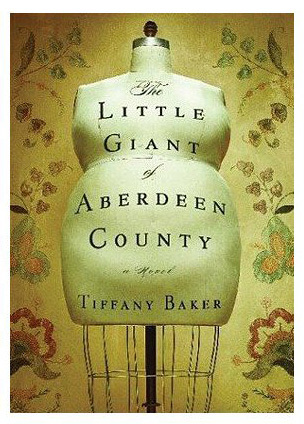 I loved the depth of The Little Giant of Aberdeen County from its characters to its setting, but especially the tone. Dark comedy is a longtime favorite of mine, and anyone who can weave a story that keeps me simultaneously smirking and spooked has my rapt attention. And if Tim Burton doesn’t pick this one up for the silver screen I’ll eat my pointy black hat. It all starts with an author’s note. “Yes, it’s true” is the message Andy Andrews shares with his readers before they even get to the first page. Otherwise you’d think you were reading a work of fiction – a story that could only come from the deep imaginings of Hollywood’s best. 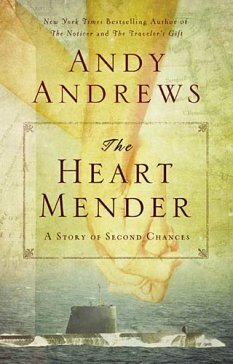 Instead, The Heart Mender: A Story of Second Chances brings forth an extraordinary true story about World War II, German U-Boats, Nazis, mystery and intrigue – and the whole thing takes place on the Gulf Coast of America. Most Americans have no idea that German submarines were out there sinking US ships right off our very own coastlines, but it’s true. Just the tip of the iceberg in this true tale, The Heart Mender tells about a woman who’s living the heartbroken life of a young WWII widow. She was cold, unforgiving, and angry. So when she finds an injured German soldier washed up on the Florida shoreline, the last thing on her mind is helping him. The Heart Mender is full of real mystery and intruge it’s true, but it’s also a story of romance, forgiveness, and the often unexpected good heartedness of humankind. Remember the whole Bridges of Madison County thing where we all bawled our eyes out because we thought it was true? Then no one could turn up any National Geographic issues with bridge photos, we found out the author made the whole thing up, and readers everywhere threw up their hands in despair at the trick. But The Heart Mender is the real deal, and it’s every bit as necessary to keep the Kleenex at hand at the end. (Okay, at the beginning and middle too.) So if you need a bit of enccouragement – indeed if you need your own heart mended – and if crying your eyes out over emotional, jaw-dropping endings is your thing, here’s your next read. Alix Cleo Roubaud was born in 1952. A talented photographer not well known during her lifetime, Alix was what one could call a tortured soul. She was often depressed, suicidal, and an abuser of prescription drugs and alcohol. She died of a pulmonary embolism at age 31 having also suffered from severe asthma. This may sound like the setup to a French art film, but in fact it is a very true story. Alix left behind not only her brilliant photography work, but her journals as well. The recently translated Alix’s Journal gives an English speaking audience a very personal look at the life and death of this talented artist. In her will, Alix left the journals to her husband, revered writer Jacques Roubaud. He was not allowed to read the journals until after her passing. But he knew they were written with the intent of publication after her death, which she seemed to understand would most likely come all too soon. Alix Cleo Roubaud’s style of writing is at first complicated, difficult to decipher. But it only takes a couple of pages to latch onto her dreamlike flow, her own unique usage of punctuation, and the depth of her soul and intelligence. And no doubt Alix’s intelligence was part of what haunted her. Reflected in her photography which is also shared in this book, her depression left her somewhat of a hermit, finding little solace except through the numbing effects of alcohol, cigarettes, and pills. Within the book, Alix’s photography shows her alone, occasionally with her husband, but always indoors – usually an apartment, a bedroom, a simple hotel room. Lonely settings all, but what shows through time and again as a true support through her loneliness was her love for her husband, who she often wrote to directly in her journal, as if she fully understood he’d read her words when she no longer was. Alix’s Journal was originally written in a mixture of French and English, her two native tngues, having grown up speaking both interchangeably. In this publication by Dalkey Archive Press, Alix’s words are translated into English by Jan Steyn. A beautifully melancholy work, Alex’s Journal ends as only fiction is expected to do, but as only true life can manage. Some familial relationships seem easy. Others take every ounce of strength we have to endure them. Whether our relationships with our family members are smooth or jagged, they both require time, energy, and commitment. Anne Koroda Duppstadt of The Love Ceiling knew that all too well. At 64 years old, one might assume time would be opening up for her, now that her family had grown. But with an adult daughter moving back home, her husband going through a retirement crisis, and her father, a famed artist, giving her as much difficulty as ever, she’s beginning to wonder if she’ll ever get the chance to pursue her own artistic dreams. 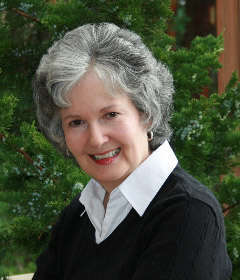 Author Jean Davies Okimoto’s writing is clean and bright, and she has the ability to relate to her audience and make them feel at home. Her characters will most likely be recognizable in some form as people in anyone’s own family unit. One thing that really struck me with this novel was the recurring sensation that I was joining in on the family conversations and the talk amongst friends over a cup of coffee. Not the frivolous gossippy sort, but the sharing of heartache or the confiding in one another that most women find vital in the navigation through life. I’ve often read books where this sort of writing almost comes across as forced, or an “as the author I can relate to your normal life” tone that stays on the surface and doesn’t ring true. But Okimoto, through realistic and well-written dialogue (she is a playwrite, after all) exhibits the beauty that is part of tight family relationships, and the pain of it too. Another important part of this book that can’t be overlooked is the theme of women and creativity. As caretakers of our families, we often shelve our creative endeavors, put the dreams on the back burner because we’re raising children, building a family, etc. Great and noble things, to be certain! But sometimes it gets too easy to leave things on the shelf when they really need to be dusted off and put to use – for ourselves as well as for those we love. Because our families benefit from seeing us thrive and finding fulfillment too. 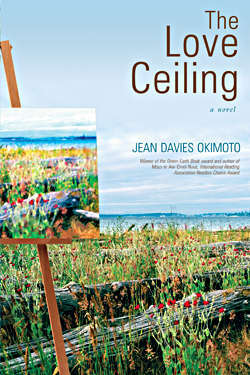 The Love Ceiling is an inspiring story of a woman who doesn’t say “it’s too late to start now”. Based on Okimoto’s play “Uncle Hideki and the Empty Nest”, The Love Ceiling is the perfect novel to read when it’s time to remind yourself that it’s never too late to chase your dreams. Fresh and clean, the jazz pop trio from Hungary called Mizar debuts their first international release, called Natural Design. Reminiscent of 80s soft jazz and pop, the group’s tunes often call on a world beat flavor to add international dimension . Lead singer Fanni Sarkozy’s vocals are smooth and mellow, even soothing. And the overall feel of Natural Design is up tempo with warm tones. Track 7, A Tale of Two Hearts, is my personal favorite and offers up some gorgeous violins and treats you to a dose of traditional Hungary seeping into the mix, just to remind you where you are. I’ve enjoyed getting to know this CD, and it seems I’m far from the only one. Smoothjazz.com, a longtime favorite internet stop among jazz fans, has been giving Mizar air time on their online radio station. Several jazz radio stations around the U.S. have been taking notice and spinning their tracks as well. And that beloved of jazz magazines Jazziz? They’re calling them “engaging and atmospheric“. And carp(e), a smaller fish in the big pond of indie music (that’s me in case you hadn’t yet noticed where you’ve landed), thinks the original Mizar, famed star of the Big Dipper, may have a bit of shining competition. This jazzy version of its celestial self has its own way of expression: smooth jazz drawing on various eras and cultures to build its own Natural Design. Video: While Natural Design is performed in English, the below Szombat Reggel is in Hungarian. 1.) Just tell me what you enjoy about Mizar’s music based on the above clip. Or visit BeagleBeat and tell me what else you liked there and why. (***You may enter once a day, but please list a new item you like each time.) Remember, leave an interesting comment. If I cannot contact the winner, you might be chosen instead based on your comment. Feel free to do all four to gather multiple entries to win! You have until midnight EST on Wednesday, May 7, 2010, to enter. When a book starts thusly, one can only imagine what is to follow. 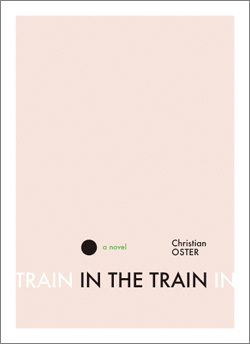 Although I could anticipate the possibilities, I at least knew the ride with Christian Oster would be nothing short of entertaining brilliance. And I was right. In the Train , translated from the original French by Adriana Hunter, tells in first person how one man named Frank, in his eccentric attempts to find a woman, meets a likely prospect at a train station. Finding unusual and sometimes embarrassing ways to stay in her presence, the resulting 148 pages form a book that you don’t want to read in public. Unless you enjoy laughing out loud in the dentist’s office waiting room, that is. One thing I appreciate in Oster’s writing is his ability to convey to the reader what others think of the narrator – even when the narrator is totally clueless as to how others perceive him. And Oster can keep his audience cringing with embarrassment over Frank’s behavior while simultaneously laughing and hoping for more of the same. But In the Train isn’t a laugh-a-minute, fluffy entertainment piece. This story can be viewed through many windows. For instance, our train traveling individual finds himself in situations where all he can do is suppose things. He supposes how others view him, he supposes what’s going on in their minds, he supposes one thing after another – correctly or incorrectly as the reader is left guessing. As his assumptions shift, grow, get tossed and reformed, it’s as if the story – and the reader’s assumptions – morph constantly from one possibility to another. And isn’t that how our lives indeed go? As we choose how to perceive situations, even the people around us, don’t we write and rewrite our own realities? And will the man of average height who took the train to chase the girl write his own reality, and eventually win her over, despite his lack of social graces? One need only read the book to find out. Want to win your own copy of the book I couldn’t put down and finished mere hours after receiving it (woe is me – when’s the next Oster?) I have an extra copy to give away, fresh from Object Press. 1.) Just tell me about a preconceived notion you once held but was shattered. Or perhaps you were right all along. (***You may enter once a day, but please list a new item you like each time.) Remember, leave an interesting comment. If I cannot contact the winner, you might be chosen instead based on your comment. 2.) Blog about, Twitter, and/or Subscribe! Get an extra entry for each of these activities. This time just leave a separate comment for each (only one time for each extra activity completed), giving me a link to your blog post, your Twitter name, and/or a note saying you’re a subscriber. (Subscribe in the upper right ! Feel free to do all five to gather multiple entries to win! You have until midnight EST on Monday, April 19, 2010, to enter. I have read and reviewed numerous short story collections here at carp(e). Most of them contain a theme of some sort; occasionally they’re as apparent as having a group of stories about the same characters. Other times, the common factor is harder to detect – an emotion, for instance, or an exploration on one facet of the human condition. With “Where The Dog Star Never Glows ” by Tara L. Masih, a common thread I discovered was surprisingly a feeling, or a spirit in the story telling. That beautiful spirit that permeates Masih’s short stories is nothing short of extraordinary. Truly written from the heart of a poet, her ability to turn a phrase is more than appealing to this particular reviewer. Each story is set in an unexpected setting;the island of Dominica, Texas on the Mexican border, India. Every one is filled with imaginative, solid characters that are easy to connect with, difficult to part with by story’s end. Most of the stories have the characters placed in the midst of change – sometimes headed for the better, sometimes the worst, often with the location playing a major role. Throughout the book there permeates an unexpected sense of peace, even as characters battle against tough life decisions. Settings and people alike are brought to life with well-chosen words handled like paint on a canvas, leaving the reader with lucid imagery and a sense of deep reflection. When well written, short stories have the ability to leave the reader with strong emotions in a smaller span of time – often within a mere few pages. Masih’s stories have managed to stay with me days after finishing the book. The final tale in particular, “Delight”, will hold a special place with me for quite some time. 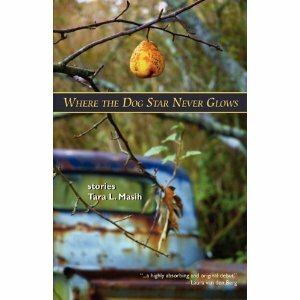 If you’re a lover of the short story, do yourself a favor and check out “Where The Dog Star Never Glows ” by Tara L. Masih. The vivid colors of this collection certainly will glow, and for a long time. Want to win your own copy? We’re giving one away! 1.) Just tell me about a place that changed you. Maybe it changed you for the better, or maybe it was for the worst. (***You may enter once a day, but please list a new item you like each time.) Remember, leave an interesting comment. If I cannot contact the winner, you might be chosen instead based on your comment. Feel free to do all five to gather multiple entries to win! You have until midnight EST on Wednesday, April 7, 2010, to enter. © 2016 carp(e) libris reviews. All rights reserved.